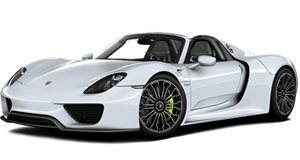 To prove to the world that the Porsche 918 Spyder was a proper supercar that could destroy any track day, the automaker put a German Porsche factory motor-racing driver behind the wheel of the supercar and lapped the Nurburgring in . The 918 Spyder that lapped the Nurburgring in that time had exposed carbon fiber with a wrap on top in lieu of a paint job for more weight savings. Yes, Porsche decided not to paint the supercar to cut weight. With its matte black wrap and exposed carbon fiber, the 918 Spyder weighed 14 pounds less than the regular supercar did. CNC Motors in Ontario, California, has an identical twin to the 918 Spyder that circled the Nurburgring for sale for roughly $2 million. Just like the one that set that blistering lap time, this 918 Spyder for sale is finished in bare carbon fiber, has nomex-covered racing seats and comes with the Weissach Package for even more weight reduction. With 1,856 miles on the clock, this 918 Spyder is one of a kind and shouldn’t have a problem finding a new home.